Back in December, we did a gamer’s version of the game “Would You Rather.” We had a fun time with it, so we thought we’d do another one. This time around we have a stricter theme and have decided to have the questions focus on Pokemon. To start off, Rachel, would you rather be a gym leader or a coordinator for the Contest Halls? Gym leader, definitely. I always had fun with the contests, but I found them to be a bit boring at the same time. I want to be where the action is. Plus, I want to be a big shot. Kris, would you rather never evolve your Pokemon or only be able to evolve certain species of Pokemon? It depends on the certain Pokemon species, really. I’d probably choose to evolve certain species while leaving others to stay in their first tier. I don’t mind unevolved Pokemon on my teams. Other than walking, would you rather travel everywhere by flying or surfing? That’s a tough one. I’d have to say surfing though, I think. While I would love to fly on the back of my Charizard, I don’t think I’d been too keen on the height. I wouldn’t mind being a type specialist at all. It would be deciding on the type that would be the problem for me! 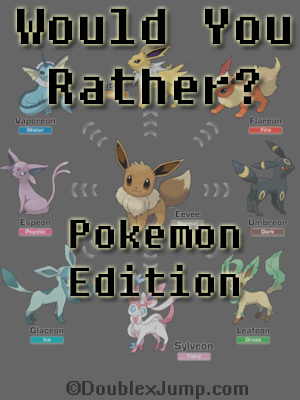 Would you rather raise an Eevee and never evolve it, or have its evolution be a complete surprise to you? That’s hard… I love Eevee, but I also love the special types other than Normal. I think I would rather evolve it and be surprised. Would you rather have your main starter (like Bulbasaur, Squirtle, and Charmander) be a complete surprise or go into the wild and have the first encounter be your starter (like Pidgey or Caterpie)? Oh, that’s a toughie. I’m honestly good either way, as a Pokemon is a Pokemon, haha! I’ll probably go for a surprise main starter, especially since they’re the rarer ones in the Pokemon world. One last question for the road: would you rather be a champion of a region and always defending your title and the land, or would you rather never beat the elite four and constantly travel while training? Travel. I think I would like to see the world, especially all the different regions. It would give me and my Pokemon more freedom and I could train different teams. There’s just so much to do in the Pokemon world! What are some of your answers to these questions? Let us know in the comments below! I know, right…? I’m waiting for virtual reality to be 100% and they create Pokemon. There’s still hope for Digimon? That’s entering a different world if memory serves right. ;-; Maybe we’ll get our own Digimon. That would be interesting too! Though I never did get into Digimon. These are hard. I’d be a gym leader, first of all, and I’d probably use Psychic-type Pokemon. I guess not knowing which species I could evolve, I’d be fine keeping the cute unevolved versions. I would probably fly around for convenience’s sake, though I’d be really scared flying on a Pokemon so high on the air. I don’t know how these Pokemon protagonists do it! Going with the Psychic-type gym theme, I’d have a team of them. I’d be fine with a surprise Eeveelution given how awesome all of the choices are. I love the starters, though it would certainly be interesting to have a random Pokemon. I’ll choose starters to be safe, haha. I’d like to be the champion and just sit there waiting for challengers. Though recent champions have been willing to go out and do important missions in the world, so I’d probably get to experience both! Fun questions!